The Dennis heavyweight 36" (91cm) dedicated machine, 3 section rear roller and steering brakes make this 350kg machine easy to manoever. Excellent stripe pattern and rolling characteristics. 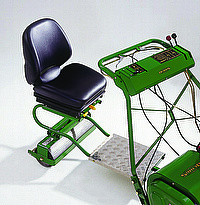 The Dennis Premier has been designed with over 75 years of experience and is used worldwide cutting football, hockey, cricket, tennis, rugby and ornamental lawns. 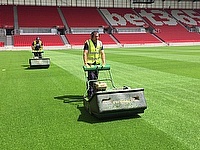 Ideal for sports clubs, stadia, contractors and local authorities. High quality Sheffield steel cylinder and bottom blade with 6 blades in opposed spiral format to throw the grass evenly into the box. Adjustment of bottom blade to cylinder easy and positive with single spanner. Margate, the birthplace of the British seaside is undergoing something of a renaissance and the town is set to boom. 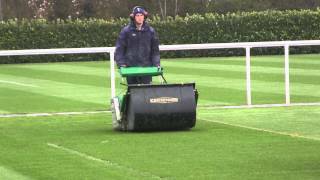 So too is the town’s football club after a new owner injected new ambitions into the team; starting with improving turf maintenance equipment with the purchase a Dennis Premier. Award winning Groundsman Rob Brooks relies on his Dennis Premier mower to get the pitch at Alfreton Town FC in the perfect playing condition required for this progressive club. 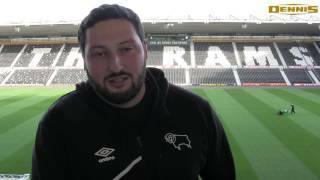 Alfreton Town, based near Derby, moved up to the Conference last season after winning the Blue Square Bet North division, and the more intense training programme required at this level has placed extra demands on the pitch at the Impact Arena.